Lane Johnson and Brandon Brooks. Brandon Brooks: I'm extremely excited. I've never been this far before, and you never know when you're going to get back, or when you're going to get another opportunity. I know it's cliché to say take advantage of the opportunity, but you really have to, because you never know when you're going to get back here again. For example, before this year, Wiz [left guard Stefen Wisniewski] never got to the playoffs. [Tight end Brent] Celek said he went to the NFC championship his second year [in 2008, when the Eagles reached the NFC championship and lost to the Arizona Cardinals]. He thought he would be coming back year after year. Here he is, in year 11, back at it only for a second time. This is my first time going through it all, so every opportunity you get, you have to take advantage of it. I will say that there is no need to press. Play how you've played this whole season. That's what won us games. Each individual person's play will come to them in time. When it comes, you have to be ready for it. You're smiling, you seemed really relaxed for this. BB: There's been a lot of hype this week about the Super Bowl deal, I just keep telling myself that it's just another game. There's going to be a lot more media, a lot more leading up to the game, but when the ball is kicked and the ball is snapped, it's going to be just like every other game that we've played. I think you guys are the better team. But do you like the fact that you're still considered underdogs? BB: Yeah, we've done extremely well when it comes to having that chip on our back. That's something we embrace. The city embraces it. That just gives us extra juice. We love being doubted. We've been doubted all season. We've gone through different adversity and we've overcome it. We've had that discussion about being on that flatbed going down Broad Street. BB: It's something that I'm looking forward to. It's going to be exciting. I know the city is going to be on fire. Finally, what's on your mind? BB: Nothing, just opportunity. We have the opportunity of a lifetime in front of us. We have to take advantage of it and seize the moment. We can't press. We have to let things come to us. But when they do, we have to be ready for it. Have you guys put in a game plan for New England? BB: We've bounced a few things around. I think you played a better defensive front against Atlanta and Minnesota. What does New England do that you have to watch out for? BB: They work well as a unit. Matt Patricia has been a hell of a defensive coordinator for a long time in this league. He's won championships with Bill [Belichik] and puts a good game plan together for any offense. They're big up front, stout in the middle. They have good linebackers and you hear about their secondary back there. You've never been through anything like this before. I've never been through anything like this before. How much does the experience of being at the Super Bowl weigh into everything? You're balancing so many different things. Obviously, you as a player are insulated from some of these things, but there is a lot of BS to put up during Super Bowl week. BB: It's part of the game itself. There are distractions that he had [during the season] and what we've overcome. When it comes down to it, when it comes to playing football, putting our pads on, knowing they do the same thing, man, it's just another football game, like the last game was. There's no difference when it comes to games in the regular season when it comes to that. Can you imagine yourself on the flatbed of a truck coming down Broad Street? BB: That's why the game has to be played. When I saw you walking off the field after the NFC championship. You seemed content, but not exactly going crazy like everyone else. I can see the explosion coming. I can imagine you and Lane doing confetti angels on the turf of U.S. Bank Stadium. BB: That is definitely something that I will do. I will hold you to that … As for you, Lane, what do you think about this New England defensive front? LJ: I think they're solid. They don't make a whole lot of mistakes. They're not overly talented by any means, but they're consistent and they perform well as far as gap sound. They play to the whistle and they're well-coached. The Eagles are in an interesting spot here. They have the pedigree, but the Eagles may be the better team. LJ: Yeah, but sometimes it's not necessarily the best team that wins. You have to limit mistakes. You have to limit any pre-snap penalties. You can't do anything to beat yourself. I think a lot of teams that go in there [playing New England], the Patriots do their number, but a lot of teams do their own number on themselves and let the Patriots have the win. 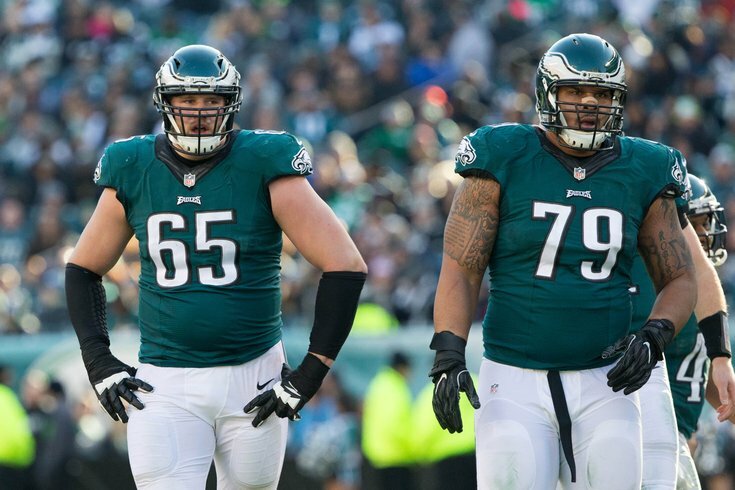 The Eagles offensive line seems to be getting better. LJ: More reps and I think we know what's at stake. It's a do-or-die situation, and anytime you're in situations like that, it's a must that we go out and perform the way we're capable of. That's what we're going to try and do. Is the underdog thing kind of gone away after winning the NFC Championship? LJ: I think in Vegas we're 5½ point [underdogs], and face it, the Eagles haven't been in the Super Bowl since, what, 2004? I can see why they're favorites. It looks good on paper but that's why you ultimately play the game. LJ: I feel good. I'm ready to go. This is the healthiest at the end of any year I've played, so I feel good, I feel ready. How unusual has the preparation for this week been? LJ: It hasn't. We're trying to stay consistent and treat it like a regular game week for us. We're practicing and not disrupting any type of rhythm we have. With football, it's all about the reps. That is the only way you can good at it. Walk-throughs can only do so much. Are you thinking ahead a little? I was teasing Brandon about you and him making confetti angels if you guys win. LJ: It's a dream that I want to make a reality. Believe you me, we have it in our minds we want to win this game and we're doing our best to prepare for it. We respect the Patriots. We respect everything they've done, but we're here to win the ball game. I'll probably do a whole lot of stuff [if the Eagles win]. [The confetti angel] will probably be one of many things I'm going to do if we win. In addition to reading Brandon's and Lane's comments, each week we'll post audio of the full interview so you'll have a chance to hear their words in their own voice.